I just had to show you where I went a few days ago! They were having an open house in a little town about 30 minutes from me. 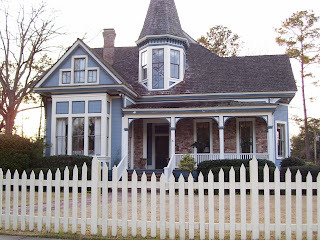 I have always been fascinated by this house every time that I've seen it. I was so excited to find out that they were having an open house so that I could get to see the inside! I'm telling you...it is the most beautiful house! I wish that I could have taken pictures of the inside. I didn't think that they would let me. I didn't even ask. I know that they knew that I would never be able to afford a home like this. 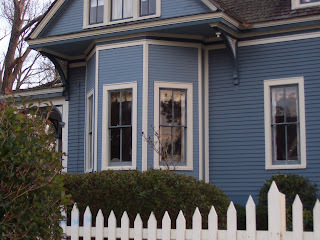 It was built around 1880. It has over 5000 square feet. 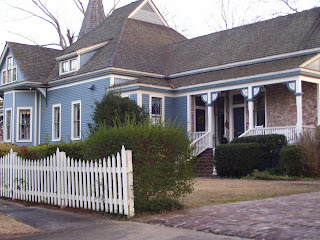 It has a formal dining room and a ladies' parlor and a gentleman's' parlor. It has a library and an office. The kitchen is to die for! It has white cabinets with black granite counter tops. Stained glass in the upper part of the windows in the kitchen. A huge master bedroom and bathroom! One room adjoining the master was turned into the biggest walk-in closet that I have ever seen! It has a den that has leaded glass windows across the top of the whole room and tons of built in bookshelves along the walls. The steeple or turret has little benches around it that the seats lift up and one could store games , toys, books, etc. for the kids. They said that is what the lady does that lives there. Her grandchildren love to sleep in the turret. The ceiling is painted to look like the sky. It is awesome! It has a wood shop out back and a guest house that is adorable. (My kids would never want to leave home!) It also has a huge swimming pool behind the guest house. I just thought some of you would enjoy seeing and hearing about this beautiful home. When I look at these pictures, I can imagine Cindy from "My Romantic Home" living here. Cindy, if you read this let me know what you think! It is even "Blue". These pictures were taken last summer. 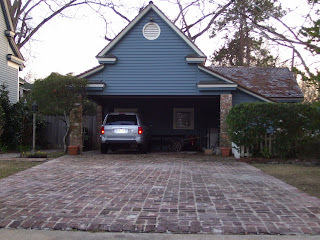 We were doing a lot of remodeling at my little cottage. 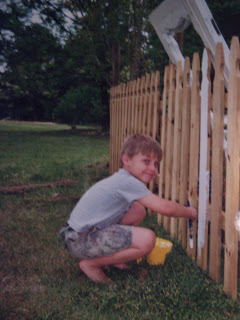 Garrett was helping to paint the fence. He had a blast! (He even painted a lot of the grass!) LOL He loves to help me and he loves to be outside so this was the perfect job for him! He was 6 years old here. 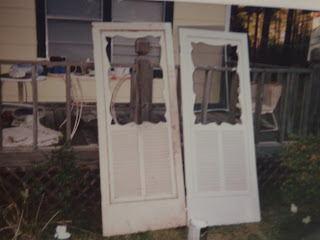 I found these old screen doors at a junk store for $20.00. I thought that they would be perfect for the cottage. I love screen doors...they remind me of when I use to stay at my grandma's house when I was a little girl. I haven't had them installed yet...maybe soon. I will love to leave the doors open and let the fresh spring air flow in through the old screen doors. I can't wait til Spring! Well...Cole is finally legal! 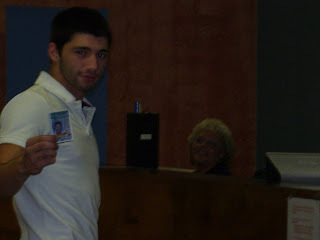 He got his driver's license a couple of days ago. I know, I know, he should have already had them before now. (He turned 17 in July.) I just kept putting it off because I thought that would be one less worry that I would have to deal with for at least a little while longer. He leaves this week-end to go stay with friends in north Mississippi. He plans to start college there this summer. He is going to work with his friends doing carpentry work until school starts. He is growing up! I have to let go and let him! I know that I've always been over- protective of him but I would do it the same way if I had to do it all over again. The ladies thought it was funny that I was taking pictures of him for my scrapbook! They thought he would be embarrassed...but not Cole! 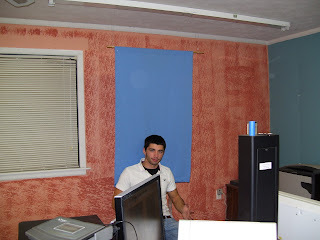 He has always loved having his pictures taken! They just don't know that I took them for my blog! Look at those faux-finished walls! What were they thinking? Makes me want to get my paintbrush out and fix them! I just wanted to show y'all a few more thrift store finds that I've bought over the past couple of weeks. I plan on putting some of the things in my booth at the vendor's mall but of course I have to keep some of them for ME!! 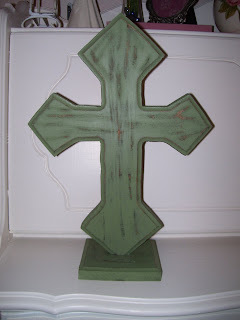 I love this wooden cross! I plan on keeping it unless my daughter decides when she sees it that she wants it. She has a collection of crosses and I know that she doesn't have one like this. It was only $2.00. 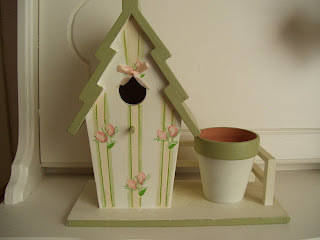 I love this birdhouse-flower pot. I will probably keep it and put it on my desk. I love the little rosebuds on it. It was only $3.oo. 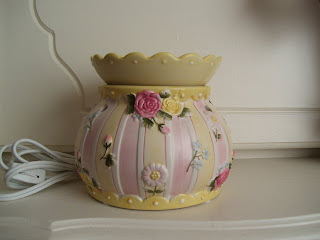 When I saw this electric tart warmer, I got so excited! It is perfect for my shabby-chic' den. I love Yankee Candle scented wax tarts. I found some where I work and the scent is called 'Cottage Breeze'. They smell so fresh and clean. Isn't it pretty? Its definitely a keeper! It was $6.00. I love this little key holder. I could hang my keys in it at the end of the day and I wouldn't have to search for them in the mornings! 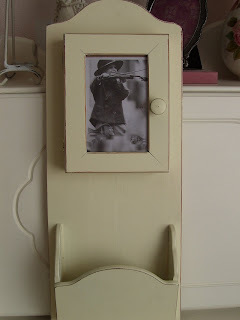 I like that it has a place for a picture and a place to put mail. It was $5.00. This last item is perfect for my kitchen. I don't have a dishwasher yet for my little cottage. Maybe it will inspire Cole to help me with the dishes! 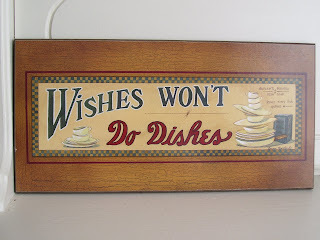 I wish....but wishes won't do dishes! Yes Deanna you caught me posting pictures! That is funny! 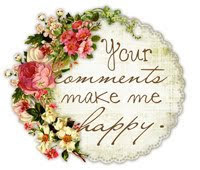 Thanks for leaving me a comment even though I had not yet typed any words yet! That was sweet! 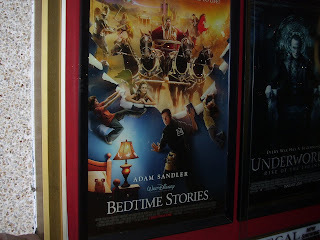 They originally wanted to go see 'Hotel For Dogs' however when we got there, they decided that they wanted to see 'Bedtime Stories' . I don't even remember the last movie that I saw at the theater. 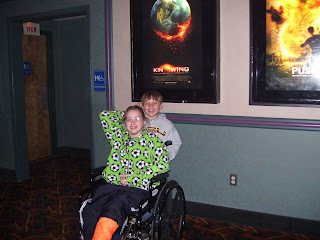 We don't go to the movies very often. I usually just rent movies. We thought it would be 'special' to get her out. They loved it! They kept laughing out loud! It was so funny! There were only 4 or 5 other people in there. We almost had it all to ourselves! I don't know if anyone else out there has ever done this before. It seems to be one of my trademarks. 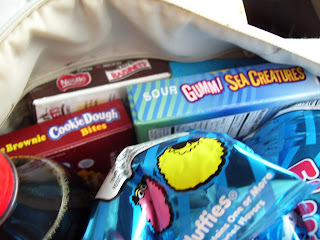 lol I always take an empty purse and fill it with goodies from the Dollar Tree for the kids to have in the movies. I'm cheap! I've done this ever since Christy was a little girl! They always make fun of me...but they sure do like the treats! (I don't buy the kids candy normally. Only for holidays and going to the movies.) We still buy popcorn at the concession stand. It wouldn't be the same without popcorn! We always put our trash back in the purse and take it home with us. Here they are acting silly! Well...I have been busy. 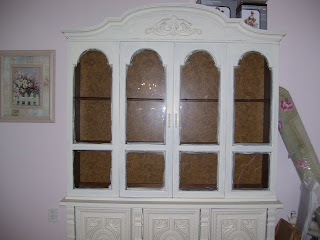 I finally got the primer and the first coat of 'creamy ivory' paint applied to my china cabinet. I still have to paint the inside. I'm thinking about a soft pink (like the walls) or maybe a soft green. I'm trying to make up my mind! It took me a while to get this far. I don't have a paint sprayer so I had to brush it all on. I got some on the glass but it will come off easily when I get finished. 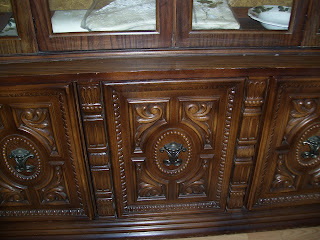 I like the carvings in the wood on the bottom doors. I can't wait to get my dishes all set up in it. 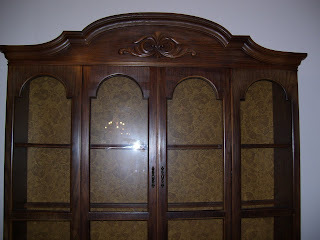 My friend Kelly over at 'Rose Vine Cottage Two', has almost finished her hutch and it is so beautiful! If you get a chance, go over to her blog and see it. She has really inspired me to get mine finished! I love that about 'blog' friends. They inspire and motivate me! If anyone has any ideas, please leave me a comment. I plan on finishing it in the next couple of days. My walls are a soft pink in this room. Do you think that it would be too much of the same color if I chose this pink? My dishes are ivory with pink roses with green leaves. I'm gonna use that rug that is rolled up leaning against the cabinet. 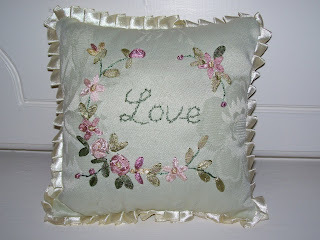 It has the light green that I was 'considering' with pink roses. These are a few more pictures of Christy's birthday. 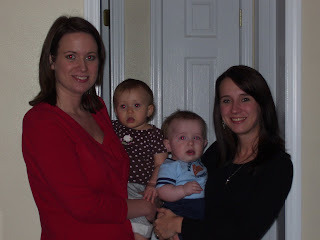 Here she is with her friend, Donna and her little girl, McKenzie. 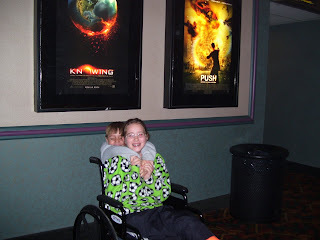 Jason and McKenzie love to play together. Donna and Christy have been friends since they were little. 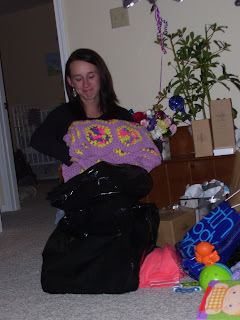 This is Christy opening a gift that her Papaw Rodney and Mamaw Pat gave her. His mother, Christy's great grandma, (Mamaw Dickey) made this afghan and pillow years ago. She is in Heaven now and I know that she was smiling from Heaven. We have such a sentimental family. 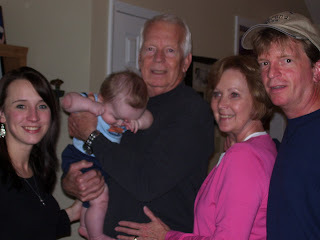 We all loved Mamaw and Papaw Dickey so much. I think about them all of the time. 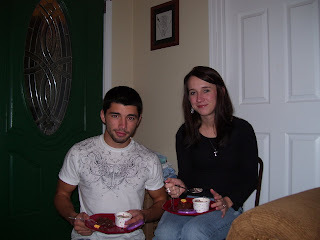 Christy and Cole. They have always been so close and I know that they always will be. She has always been like a 'mother hen' to him! I think she got that from me! That is how I was with my little sister and brother! 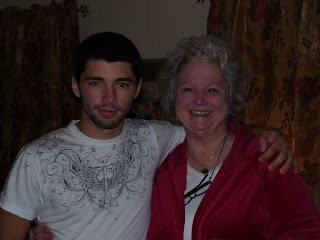 Nanny and Cole. She loves him so much! He is not even her blood grandson but she told me that he has always been hers. Isn't that so sweet? She is a very sweet lady and I love her. 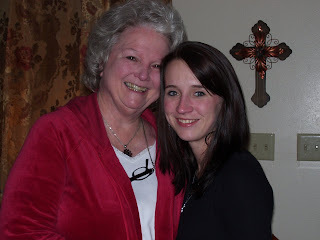 Christy and Nanny. Christy was her first grand -daughter. Don't they look so sweet together? Papaw Rodney and little Jason! 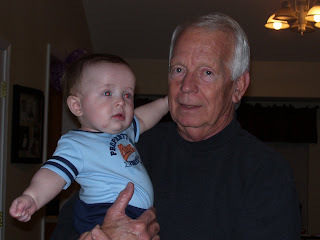 Jason is his first great-grandson! Christy, Jason, Papaw Rodney, Mamaw Pat, and Christy's daddy. There are four generations here. I know that I show a lot of pictures of my children and their families, etc. (Jason was getting very sleepy!) 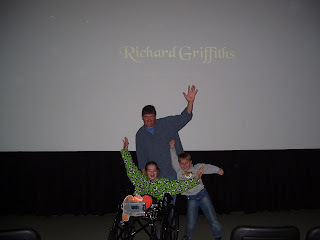 I love them all so much and I just want to be able to share what is important to me on my blog. 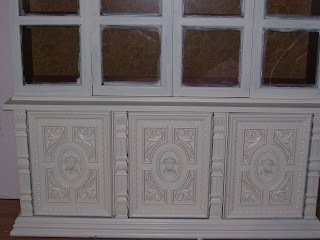 I'm trying to post more decorating projects on here also because that is what my blog was suppose to be about. I will try to do a little of both in this new year. Thanks for visiting! Look at this sweet cookbook that I got at the thrift shop for 75 cents! 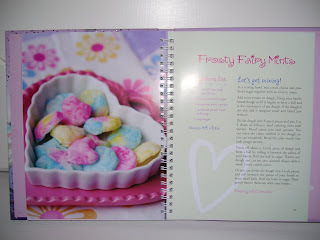 It is called 'Fairies Cookbook'. 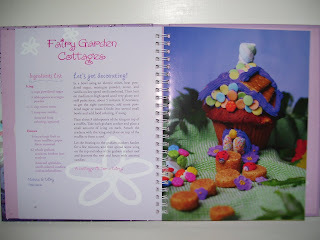 It has the sweetest little recipes in it. I had to show y'all a few of them. 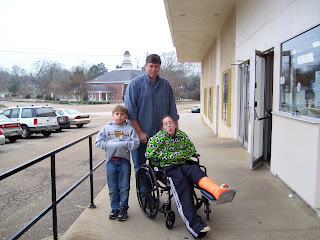 I plan on letting my little boy, Garrett help me cook one or two of them this week-end. He loves to help me cook! I even bought him his own apron and pot holders! I will have to take some pictures of him wearing it. We finished his story board last night for his school project and can you believe that I forgot to take a picture of it? He did it about the book "Diary of A Worm". We had a fun time working on it together. We glued rubber insects and worms on it and he colored pictures and pasted them on it too. He drew his own little tunnels for the worms to live underground in. We even attached a stuffed spider at the top and when you pull the string the spider wiggles up the string! His friends are gonna love that! In the book, the worm's best friend is a spider! For a mom that is afraid of bugs, I think I did good job helping him with his project. I'm just glad they were fake! I hope that he gets an 'A' on it. 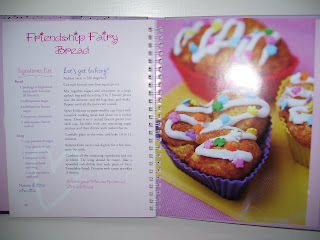 The first recipe is for 'Friendship Fairy Bread' It looks yummy! 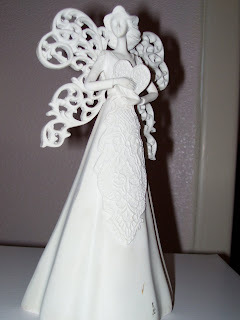 This one is adorable and I bet we will have a whole lot of fun making it. It's called 'Fairy Garden Cottages'. I just love that!! 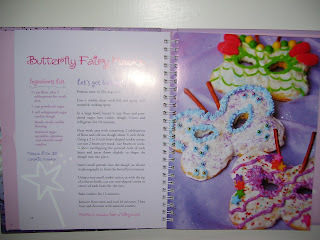 This one is called 'Butterfly Fairy Masks'. This would be so cute for a Mardi Gra party. These are "Frosty Fairy Mints'. Perfect for Valentine's Day! 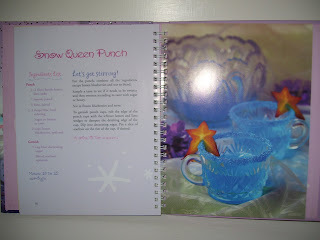 "Snow Queen Punch" Now that sounds delicious! 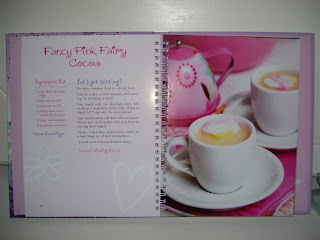 'Fancy Pink Fairy Cocoa'. Now that sounds like something I would like to have right now. 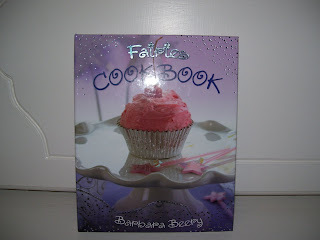 Isn't this the cutest little cookbook? 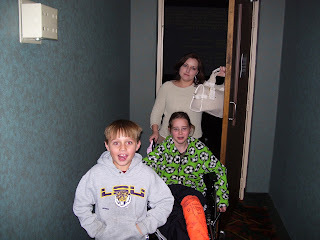 I actually did do a different post for today but I accidentally posted it on my Christmas blog. Go over and see it at Christmas with a southern rose. Thank y'all for visiting me! Good morning! I hope everyone had a good night. I slept pretty good last night. I only remember waking up once during the night. I had fallen asleep with my t.v. on in my bedroom and it woke me up with a preacher healing people. I started watching it and just thinking how I wish that God would make my Fibromyalgia pain go away. I know that He could do it. Anyway, this preacher was healing people of various illnesses, etc. and offering to send you some "Manna Bread" and some instructions on how he could heal you. He said you have to lay the bread on your body and follow the instructions that he sends to you and then eat the bread and you will be healed. Have any of you ever seen this on t.v. before? It was a first for me! Yesterday was such a bad day for me because of the pain that I stayed in the bed most of the day. I don't really know what to think about this preacher. I don't want to say that he is a fake or anything...but if he is, he will have to answer for all of this one day. I wanted to show you a few 'bargains ' that I got recently at my favorite thrift store. Isn't this little angel so pretty? I'm gonna give her a fresh coat of paint. I like that she is holding a heart. Perfect for Valentines Day! She was only $1.00. When I saw this rose picture, I just had to have it! I paid $5.00 for it. 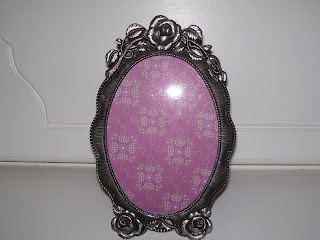 I also love this little metal frame with roses. 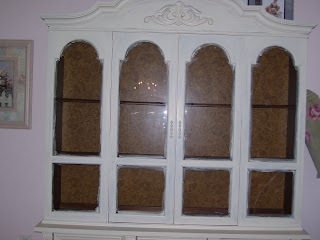 I'm gonna paint it white and make it shabby. It was $2.00. This little pillow was only 50 cents. I love it. It goes perfect with my bedroom. I bought these 3 goodies at work on the clearance table. I also got the shower curtain to match. 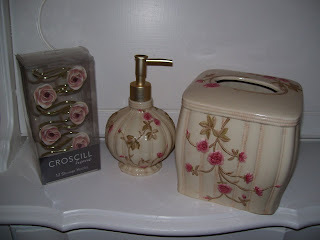 When I re-do my bathroom, I will use these. 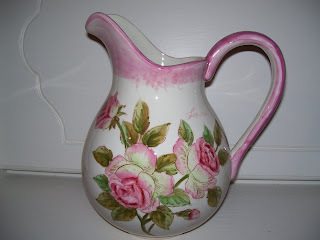 The pattern is called "rose garden". I think that I did great with my thrifty finds. 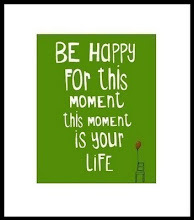 That is one of my favorite things to do! I love thrift shops! I've noticed that more people are shopping at them now than ever before. My friends use to laugh at me for going to them. I didn't care and certainly didn't let it stop me!